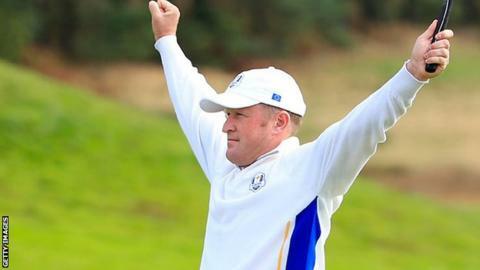 Ryder Cup debutant Jamie Donaldson is looking forward to the singles on Sunday after helping Europe into a commanding position. The home team lead 10-6 after dominating the Saturday foursomes, with Donaldson and Lee Westwood beating Zach Johnson and Matt Kuchar 2&1. The Welshman faces Keegan Bradley in the 10th of the 12 singles matches. "We're leading, but we just have to out there and try and win every match," said Donaldson. "We're in a good position but that's all we are. There's no time for complacency. "I've been playing nicely all week so I've just got to go out there and play the way I have been and get a point." His opponent on Sunday sat out the Saturday matches, but partnered Phil Mickelson to a point on the opening morning. Europe have to claim four points from the 12 singles matches on Sunday to retain the trophy. But the memory of what happened in the US two years ago will temper expectations. Europe were trailing 10-6 on Saturday in Medinah in 2012, but staged a remarkable comeback in the singles to clinch a remarkable win. Donaldson, 38, and Westwood, playing in his ninth Ryder Cup, won a point on Friday afternoon but were beaten 4&3 by Jim Furyk and Hunter Mahan in a fourball on Saturday morning. However, the pair bounced back to dominate their match in the afternoon, meaning Donaldson has two points from a possible three so far in Gleneagles. He paid tribute to Lee Westwood, who is now the joint-fifth most successful player in Ryder Cup history. "He's such a rock isn't he?" said Donaldson. "It's a good thing to know you've got someone there who's just going to mop it up if you don't do exactly what you want. "It's a great relaxing feeling to have somebody who's been there and done it so many times and been such a prolific winner."